Join Mickey, Minnie, Pluto and all their pals in the newest Clubhouse crusade. 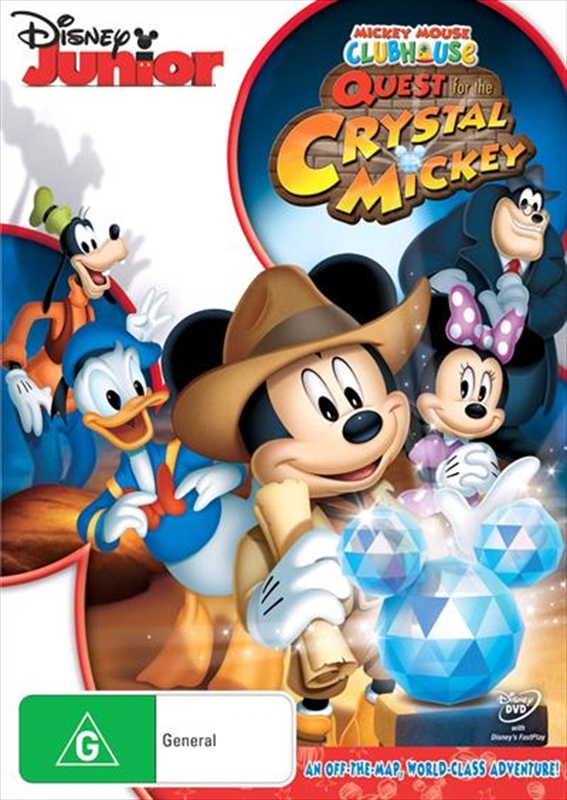 When the legendary Crystal Mickey goes missing, Mickey and friends go on an adventure to save the Clubhouse from losing its magic. Grab your hat, buckle your seatbelt, and get ready to embark on a thrilling adventure in Mickey Mouse Clubhouse: The Quest for the Crystal Mickey! Theres no time to lose after greedy Plunderin Pete snatches the legendary Crystal Mickey statue from the Clubhouse. Without this sparkly statues magic, the Clubhouse will disappear forever! Can the worlds most extraordinary hero Kansas City Mickey, get the magical statue back in time? Only with help from young viewers at homeand the right Mouseketools can Mickey journey across the Sandy Desert, brave the Rushing River and make his way through the Hidden Jungle. But watch out for Petes trickiest traps!